Looking for a job in Lake County California? The following is a directory of Lake County CA top employers with direct links to the jobs they offer. This directory includes local city job links as well as the larger job posting boards. Lake County's primary cities for this review are Clearlake and Lakeport. Only sources that have job listing pages, business directories, and/or legitimate human resources contact listings are provided below. 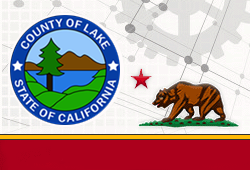 Lake County periodically has job postings such as Compliance Review Technician, County Veterinarian, Deputy Sheriff, Health Program Specialist, Mental Health Specialist, Mental Health Nursing Jobs, Occupational Therapist, Physical Therapist, Public Health Nursing Jobs, Substance Abuse Counselor, Registrar of Voters, Open Merit Systems Jobs, and a variety of Extra Help Jobs. The site provides human resources contact information. As vacancies occur, the top ten eligible candidates will be referred to a department for selection. A candidate who is not selected will remain on the eligible list and will be referred to other departments as vacancies occur. Employment in certain departments is contingent upon successfully passing a background investigation, and a physical exam is rquired for all candidates. The City of Clearlake posts positions when vacancies become available. During review there were open positions for Police Officer, Senior Maintenance Worker, and Temporary Part-Time Maintenance Worker. Check for current listings. City of Lakeport was hiring for the positions of Police Officer I, II, and III. Check for updates. Habematolel Pomo of Upper Lake had opportunities for Traditional Promo Dance Teacher, Youth Storyteller Teacher, Pomo Language Teacher, Surveillance Agent (Full-Time & Part-Time), Casino Cashier, Bartender, Slot Attendant, Security Officer, and Customer Service Agent. Middletown Rancheria had been hiring for the position of Restaurant Supervisor. Check for updates. Elem Indian Colony had been hiring for the position of Fitness Coordinator. View their site for current listings. Employment applications for Robinson Rancheria Tribal Office, Day Laborers, Recycle Center, R Pomo Pumps employment application. Robinson Rancheria Resort and Casino Employment applications. Sutter Lakeside Hospital has a high volume of ongoing employment opportunities. Here you may find openings for positions such as Nurse Practitioner, Per Diem Registered Nurse, Physical Therapist Sign On Bonus, Medical Assistant, Registered Nurse, Computed Tomography CT Radiologic Technologist Per Diem, Physician, Acute Care General Surgeon, ENT, Family Medicine Nurse Practitioner, Physician Gynecologic Oncology, Hospitalist Fellowship, HIM Clerk, MRI Technologist, Patient Access Representative, Dietary Aide, Radiologic Technologist, LVN Home Health, PT Physical Therapist, PTA Physical Therapy Assistant, OT Occupational Therapist, Staff General Surgeon, and CT Technologist / Staff Technologist. Lake County Tribal Health was established to improve the physical, mental, spiritual, emotional, and social health status of the Native Americans of Lake County through the provision of culturally sensitive health care services. During review the following opportunities appeared to be available: Physician, Licensed Vocational Nurse LVN, Phlebotomist, Community Health Representative, Part-Time Fleet Vehicle Specialist, Registered Dental Assistant, Registered Nurse RN, Pediatrician, and Public Health Nurse/Outreach Manager. Meadowood Nursing Center is a 4 star nursing center with 99 licensed beds. LVN's and RN's receive a sign on bonus of $5,000. Openings on a.m, p.m and noc shifts. CNA's will receive a sign on bonus of $1,000. Rocky Point Care Center is a premier skilled nursing facility located in Lakeport, California. Rocky Point Care Center was hiring CNA's, RN's, and LVN's on this review date. People Services in a not for profit company that offers a significant array of services for people with developmental disabilities. Adventist Health Clear Lake is a 25-bed, critical access hospital serving Lake County. Lakeport Post Acute is a premier skilled nursing facility in Lakeport, California. Kelseyville Unified School District has ongoing certificated and classified staff employment opportunities. During this review Kelseyville was hiring for the positions of Elementary Teacher, Kindergarten Teacher, 6th Grade Math/Science Teacher, Special Education Resource, Special Education Severely Handicapped, Special Needs Aide KES, Teacher Middle School ELA / History 7/8th Grade, Licensed Assistive Nurse, and Language & Speech Therapist. Konocti Unified School District is an excellent resource to monitor for an ongoing array of certified and support staff positions. Recent job postings found icnluded 1st Grade Teacher, 6th Grade Teacher, Mild/Moderate Special Education Teacher, Cross Country Coach, Science Secondary Teacher, Kindergarten Elementary Teacher, Para Educator,6 - 8 Athletic Director, Mild/Moderate Special Education Teacher (RSP), Registered Nurse School Nurse, Assistant Volleyball Coach, Elementary Teacher Pool, Instructional Coach, Mechanic's Assistant, Assistant Boys' & Girls' Soccer Coach, 2nd Grade Elementary Teacher, and Director Maintenance. Lakeport Unified School District was hiring for a variety of positions. Openings available inluded English Teacher, Instructional Coach, Special Education Paraeducator, Classroom Teacher Grades 4-6, Enrichment Teacher, Science Teacher, High School Math Teacher, Math Teacher grade 7, Math Teacher grade 8, Math Teacher grade 8, PE Teacher, Classroom Teacher Grades K-3 (Teacher Pool 2019-2020), Classroom Teacher Grades 6-10, Substitute Paraeducators, Substitute Secretaries, Substitute Bus Drivers, Substitute Custodians, and Substitute Cafeteria Workers. Lucerne Elementary School District had open positions for Grade 4-8 Multiple Subject Teacher and K-8 Elementary Counselor. Check for new listings. Middletown Unified School District was hiring. A survey of open positions found included Intervention Teacher, Secondary Math Teacher, Varsity Girls Basketball Coach, Elementary Teacher, Language Arts Teacher, Science Teacher, Secondary English Teacher, Spanish Teacher, Cook's Helper, Paraeducator Special Education Classroom Support, Campus Security, Food Service, Custodian and Maintenance Substitute, Resource Specialist Teacher, School Bus Driver, School Psychologist, and Special Ed Paraeducator. Lake County Office of Education advertises positions such as Teacher Deaf Hard of Hearing/Early Start Infant Educator, Visually Impaired/Orientation and Mobility Specialist, Education Specialist - ELD/Special Education, Instructor - NCSOE "Be A Teacher" Intern Program, and Substitute Preschool Program. The Lake County Campus is always looking for new part-time faculty members.